Automatically detect duplicate receipts, ensure accurate exchange rates, and confirm the accuracy of each transaction — all without growing your compliance team. Expensify prevents accidental fraud by training employees to code, categorize, and review their own expenses. 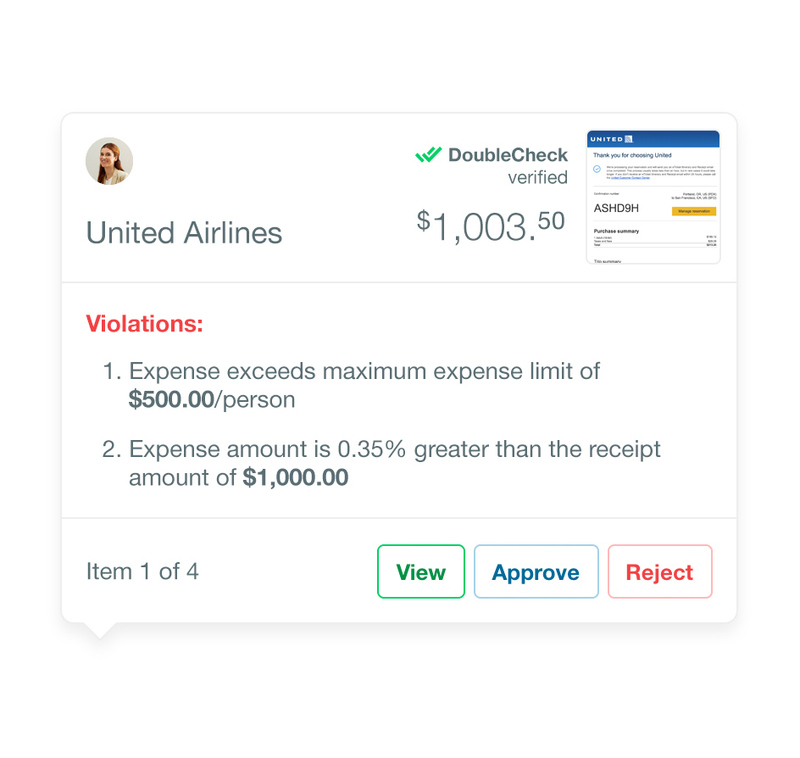 When employees submit receipts, Concierge DoubleCheck audits the transactions in realtime to detect duplicates and ensure that each receipt falls within company policy before employees submit expense reports. Once receipts are submitted, Concierge DoubleCheck verifies that employee-entered information is accurate, eliminating the need for manual auditing. DoubleCheck can be configured to review all receipts, checking them against company policy and flagging unusual activity. Concierge points out every risky expense that needs human oversight, so it’s obvious where to point the magnifying glass. Expense reports over a certain amount can be routed to an auditing team or put on a different approval workflow, saving time for everyone involved. Centrally manage employee spend with Expensify’s Reconciliation Dashboard. Admins can oversee and confirm statement amounts, review employees’ unsubmitted expenses, and ensure all expenses are synced to an accounting software.